Audi has partnered with Italdesign and Airbus to develop a new flying car concept. 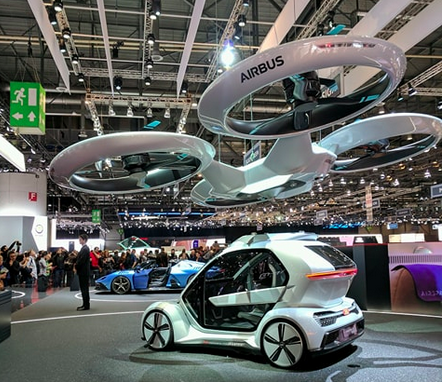 The updated passenger drone project – Pop.Up Next – was revealed at the Geneva Motor Show and is based on the Pop.Up, an electric flying vehicle revealed at last year’s show, a partnership only between Italdesign and Airbus. Design-wise, it looks very much like a super-enlarged drone, with not only a wheel at each corner but a pair of rotors as well. Functionally, it is a two-seater like a basic Smart car, given vertical take-off and landing capability by caged-in blades. These are not permanently attached, however, but part of a separate ‘air module’ that can be removed when not required, according to Car Magazine. In fact, the passenger compartment and the ground module, which allows it to drive along the road, are separate components. As such, it is described as a ‘modular, multi-modal system that enables transportation to enter into the third dimension’, and in the process avoid traffic congestion. Audi contributed mainly in the areas of battery technology and autonomous driving, even though they added a bit of design as well. The flying car is fully electric. It features eight 20kW electric motors, delivering a total power output of 160kW – equivalent to around 215bhp. This is apparently enough for a top speed of 74mph. The battery pack only delivers a 31-mile flight range, so a driver will not be hopping over the traffic for long. Charging time is only 15 minutes, but that will not be much comfort if the driver suddenly finds themselves out of battery mid-air. The ground module is equipped with 60kW of electric power – 80bhp – directed to the rear wheels. Using 15kWh of battery it would apparently go for 81 miles between 15-minute charges but can only reach a top road speed of 62mph. At the moment there are far too many regulations in the way of flying cars, though perhaps preventing the people inside from taking control with all that Audi autonomous tech will help. But a lot of very considered thought and effort does seem to be going into the project, with Airbus in particular taking pains to actually go proof of concept on the aerodynamics.